It’s good to be king emperor! This summer I’ll be making my imperial debut, i.e singing the role of Nerone (a.k.a. Nero Claudius Caesar Augustus Germanicus) in dell’Arte Opera Ensemble’s production of Monteverdi’s L’incoronazione di Poppea. The opera will be performed in Italian with English supertitles. Click here to buy tickets. 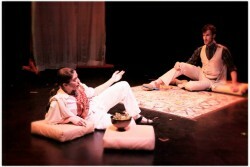 This entry was posted in Past Performances, Performances on April 3, 2013 by Alison.